Welcome to the official website for the Sand House, a unique and fascinating but little-known part of Britain’s heritage. The Sand House stood approximately 200 metres north-east of Balby Bridge (which is where the A630 crosses the East Coast Main Line railway). The site is now occupied by a 17-storey tall block of flats named Silverwood House. Click here to view a location plan. Although the Sand House is no longer physically present, its tunnels, especially, are remembered by a great many people. They survived for decades after the house was lost and they became an unofficial playground for local youngsters from the 1940s until the 1960s. 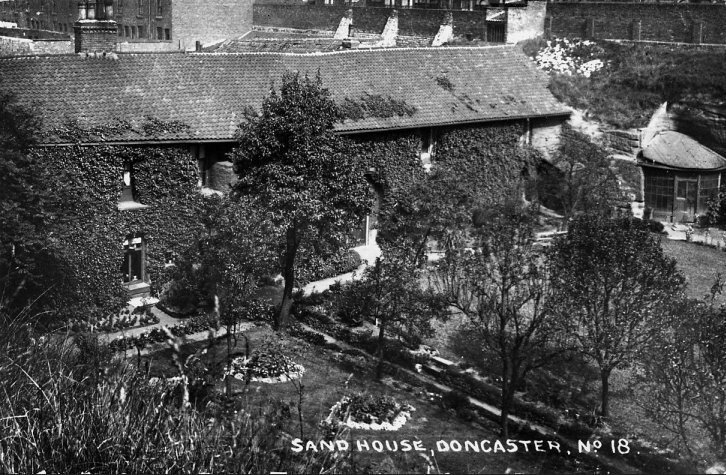 The unique Sand House plays an important role in the history of Doncaster. Moreover, it is a subject that quickly fascinates all who learn about it, wherever they may be. This has led to the creation of The Sand House Charity, through which this Victorian marvel is being given a new lease of life, inspiring educational projects for new generations. The Sand House Charity was registered with the Charity Commission on 02 March 2017 (Reg. No.1171875). The Patron of The Sand House Charity is the eminent Doncaster-born concert pianist, Matthew Schellhorn. You can donate to The Sand House Charity either by clicking on the MyDonate logo below, or on the PayPal Donate button beneath it, if you prefer that method. If you would like to receive occasional emails providing information about events and activities of The Sand House Charity, please click on the button below. Please note that any information you provide, as part of the subscription process, is kept securely by The Sand House Charity and is only used for the purpose of sending you news updates and information about our activities. We do not share your information with any other group or company, and take the security of your contact details very seriously. You may view our full Privacy Statement at this link. The Sand House Charity holds combined Public and Employers’ Liability Insurance. A copy of the Certificate of Employers’ Liability Insurance can be viewed here. The definitive story of the Sand House is told by Richard Bell and Peter Tuffrey in their book ‘The Sand House – A Victorian Marvel Revisited’ (please see our Shop page). Richard Bell, who is a great-great-grandson of Henry Senior, creator of the Sand House, is the owner and custodian of this website. If you are a teacher and would like to include the Sand House in your lessons, there is an excellent Sand House Education Pack available. Primary school teachers in the Doncaster area can use it as a local history topic under the National Curriculum. Please visit our Shop page for details of various Sand House mementoes that we have available. And if you’re a fan of real ale, we’re delighted to tell you that Doncaster Brewery produces a Sand House Blonde ale that you may like to try (although the ale is not available from this Sand House website)! Please see the Doncaster Brewery website for more details. If you would like to receive occasional emails providing updates about the various Sand House projects that are going on, please complete the sign-up form at this link. (You may unsubscribe at any time).